It depends. A baby monitor helps you keep an eye on your child when you’re not right in the room with them, so for many parents, they offer peace of mind and safety. For most people, they are not necessary. On the other hand, if you have a large home, two stories or a baby with medical issues, a baby monitor can be very useful, if not essential. Most moms gain a 3rd ear when their baby is born. You learn to distinguish your baby’s cry from all the other babies in your playgroup or hear even the smallest whimper from 3 blocks away. For some moms, hearing the constant sounds that baby makes or watching baby on a video is comforting. However, if you are breastfeeding, constantly hearing your baby could over stimulate your milk production causing you pain. In this case, choosing a model that can signal you with a light rather than sound would be helpful. Another issue is that some parents can hold themselves back from rushing in to see baby when they make any sound. It’s important to know that babies need to learn to soothe themselves and playing alone in their crib is beneficial to a babies’ development. There are dozens of baby monitors available, so how do you know which one is right for you. It depends primarily on your lifestyle. Here are some tips. 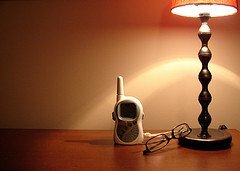 Analog or Digital Baby Monitor? Audio or Video? Most baby monitors run on radio frequency, however, some are available in a digital format. Why does this matter? Many other household appliances also run on radio frequency, such as your garage door opener, cordless phone, mobile phones, appliances, and, of course, the radio. Interference such as static, buzzing or irritating noise could make it difficult to hear your baby. If there are many babies in your neighborhood, you could get interference from other people’s monitors or actually hear what’s happening in their home. If you prefer your privacy and want to avoid interference, look for a model with no-interference technology or a digital model. Digital baby monitors encode your signal making it nearly impossible for the sounds to be heard by others and reduce the possibility of running into interference from other electronic devices. The disadvantage is that digital models generally cost more than analog or radio-frequency monitors. Many moms take a few minutes alone to catch up with friends or business on the phone. In this case, having a monitor that displays lights rather than only sound is a great convenience. How many receivers do you need? How many monitors? How much range? It’s nice to have the flexibility of taking the receiver with you so you can hear your baby anywhere and most have a battery option, however, if you use it a lot, you’ll spend a fortune on batteries. Most can be plugged in as well. It can be helpful to have more than receiver to keep in a place where you spend a great deal of time, such as the kitchen, and another to charge and have ready for on the go. For most people, one monitor in the baby’s room is sufficient; however, if you have two young children with their own rooms, you may want to have two monitors. Most systems will interfere with each other if you have them in close proximity. There are a few models on the market with more than one monitor. How much range you need will vary by your use. If you have plan on gardening in the backyard, you’ll need a longer range than if you plan on being just down the hall. If you’d like to be able to walk to your mailbox, consider a longer range. Another important factor to consider is battery life and if the battery is rechargeable. If you’re lucky enough to have a baby that takes long naps, you’ll want to have the capacity to listen for them until they wake up and are ready to be with you again. Some systems even have movement sensors to tell you when your baby is wiggling. For most people, an audio baby monitor system is enough. If you have a child with medical issues, a video monitor is definitely recommended so you will be able to see the baby’s breathing and movement. If you choose a video baby monitor, make sure it has good sound as well as you will not be able to watch it constantly. There’s nothing better than checking on baby yourself, just so you know she’s alright. In general, for most people, having a baby monitor is a nice luxury. Looking for a Safety First Baby Monitor?